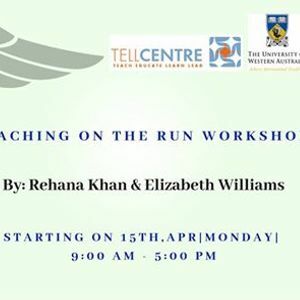 This is a 3-day Teaching on the Run (TOTR) Workshop in collaboration with TELL Centre and UWA starting from 15th April, 2019 at 9:00 am to 5:00 pm Monday. Pay Rs. 15,000/- within March to avail the Early Bird discount. --> Take home participants handbook with tips and notes. --> Templates for lesson planning, learner support, etc. --> TOTR teaching tips book written by Fiona Lake & Gerard Ryan. The TELL Centre / UWA provide leadership in clinical facilitation support training through its TOTR program. These interactive workshops are leading as most popular and versatile resource for health professional individuals and organisations. 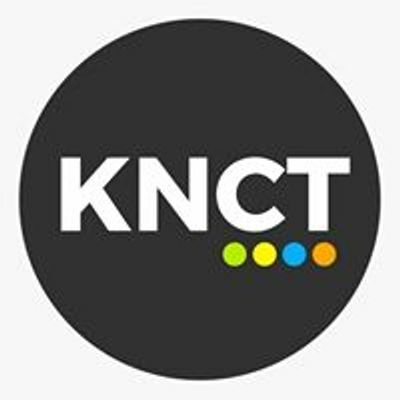 Workshops include a suite of teaching skills for improving clinical teaching, supervision, assessment and supporting learners in a clinical context. 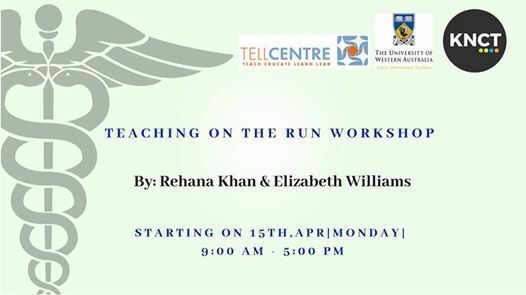 The renowned instructors Rehana Khan & Elizabeth Williams are going to lead the TOTR workshop. Elizabeth Williams is a Clinical Nurse for 40 years with extensive knowledge and skills in clinical facilitation and education in the Australian Health System. Presently, working as an educator with a health professional training provider in Sydney, Australia. Specializes in supporting challenging students with their trajectory to a successful professional career. Rehana Khan is a highly experienced health based teacher. She demonstrates extensive experience in clinical education and facilitation both in Australia and Pakistan. Rehana is director of the clinical education training provider PRAXIS & beyond, Inc. If you are interested to improve your teaching and learning skills you should attend these interactive sessions. You will learn ways to become more efficient and effective when teaching in the workplace. In addition, you will come away with practical skills that you can immediately apply in your role as a teacher, assessor and/or supervisor. A Seminar On " Child Abuse & Neglect"